The Tax Lady : Telecommuniting- Does It Work For Everyone? Telecommuniting- Does It Work For Everyone? While the idea of working from home may seem like dream job to some, is it right for everyone? Are you someone who is easily distracted by things going on around you? Or are you able to focus no matter what the environment. Some jobs are easier than others to do from the comfort of your home, but if you rely on others from your office to contribute to your productivity, then working from home may not be ideal for you or them. There will be added stress and work for the person that's in the office and they will be overburdened and more than likely will become resentful. Less Time in the Car: You can save time, gas, wear and tear on your car and aggravation when you don't have the hectic commute. Fewer Interruptions: You don't have co-workers interrupting your work flow with idle conversations and non work related chit-chat. Less Eating Out: You can cut down on lunch expenses when you're not going out every day for a bite to eat, that will help your waist line too. More Flexible Schedule: When you're working from home you can start your day sooner, when you don't have the hassle of the morning commute. You are able to pick up your sick child from school. Social Interaction: You don't have the daily banter with of co-workers and may find yourself out of the loop with what's going on and not as much part of the "team". Loss of Regimen: You don't necessarily have the 9-5 hours anymore, your boss or co-workers may rely on you to be available or work on things when the "normal" office hours are over. Distractions: We all tend to let our mind wander as it is; when you're working from home you need to have self-discipline to focus on your work and not what needs to be done around your house. You could have a loud neighbor that may interfere with your concentration too. Family Stresses: Let's face it; if you have a toddler at home to take care of, working from home is next to impossible. Toddlers need your constant attention and other family members may rely on you to do more around the house, since you are "home" all day. 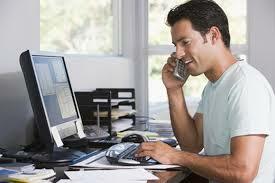 If you are fortunate enough to have the work from home option, you will need to set boundaries. You need to set your hours and keep them. You must treat your workplace at home as if you're in the office. You have to maintain a level of self-discipline that often doesn’t come naturally; but it's vital to your success!